The OF77 features the all new SpaSoft Coolmax interior which combines the moisture wicking properties of Coolmax with the anti-microbial properties of bamboo. The OF77 is like having two helmets in one. It offers the comfort of an open face helmet with the ability to quickly and easily convert into a full face helmet with the installation of the optional snap-in jaw piece. New SpaSoft DuPont Coolmax® interior keeps you dry and comfortable. Coolmax® wicks moisture away from your body and dries quickly. Charcoal bamboo fiber keeps odors away by eliminating bacterial growth. Removable, adjustable, washable Spa Soft Coolmax® interior allows for easy cleaning and custom fitting. 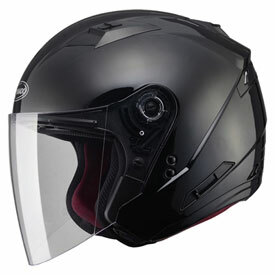 GMAX D.E.V.S (dual exhaust venting system) top and rear vents reduce temperature by allowing hot air to escape from the top of the helmet. Vents close to completely seal out the cold. 100% UV400 protection from the anti-scratch hard coated face shield for a longer lasting clear view. Tinted inner sun shade with anti-fog coating. Lightweight ABS shell. Large size only 3.2 lbs. Does this helmet come with the option snap in jaw piece? If not how do we get that? BEST ANSWER: You will have the purchase the snap in jaw piece separately. We do carry this piece here. The part number is 1817290001.